Last month I was given a box containing shaving products from my friend in the UK. The first on the list was Palmolive shaving cream and now I’m dipping into the box again and pulling out Ingram an amazing mentholated shaving cream that’s sure to please. This is another staple of the UK. I’ve seen it advertised on websites there for as low as $2.00. Looks are deceiving here because this underestimated looking shaving cream is a one of the best I’ve used. 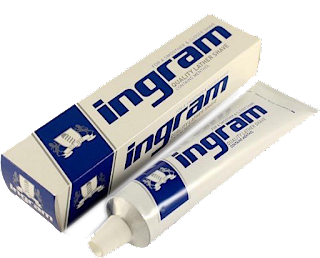 The scent on Ingram is very much akin to Brylcream a hair gel for man which I do use from time to time so I have no issues with it. I like to read the instructions so I have a good idea of the limitations of a product and right off the bat it said I could use a brush and that made me happy. The instructions continued Wet the face then rinse the brush with warm water add a dab or two of the shaving cream to it and apply to face. As you work it into your beard you can feel the shaving cream starting to build and in a minute or two, you will get an intense menthol sensation which will last until after the shave about 10 minutes or so such a fantastic feeling. This cream has plenty of slickness and glide which you will notice after your shave. It allowed me to go over stubborn spots with ease. The post shave feel was also top shelf. In retrospect, I should have used a mentholated balm to end the shave like the one from Soap Commander maybe next time. So, I had a great shave and would absolutely recommend this to every wet shaver. Of course, if you’re not a menthol head like me then you can skip this one. But if you order one now online you’ll be glad you did.